ASF file format was made by Microsoft to stream visual and audio content. The ASF files are actually containers for streaming media and they normally include files for Windows Media Audio or Windows Media Video. 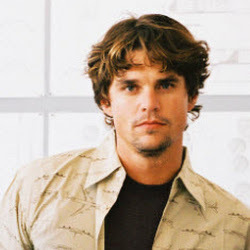 Because ASF files are designed for streaming, one big shortcoming is that its maximum resolution is a little bit smaller than other formats and it can’t be played on the popular players such as iPhone, iPad, iPod, Apple TV, Android, PSP, Xbox 360 or editing programs like iMovie, so you may need to convert your ASF files to some more common formats such as MP4 or MOV, etc. There are many programs available for video conversions and they will allow you to convert ASF or Advanced Systems Format files to other popular formats. But here, the best video converter tool I want to recommend to you is Aimersoft Video Converter Ultimate, for it can help you to change your ASF files to MP4, WMV, MOV and more quickly and easily. 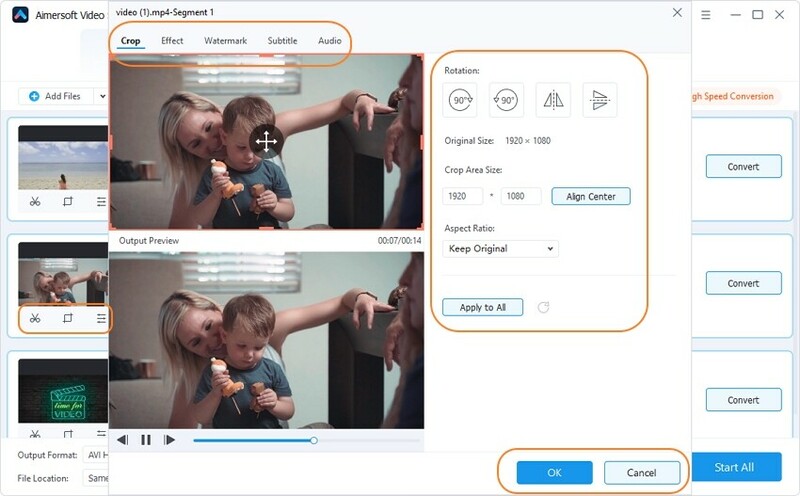 The Aimersoft Video Converter program is designed as a high-speed digitalized video conversion tool that can convert literally all types of video formats seamlessly. All you have to do is to download the program and follow the guidelines to convert your videos. This smart tool has features that can deliver fast speed and the highest quality for output videos. When you use this tool, you could enjoy your ASFs content on supported applications and devices such as iPhone, iPad, iPod, Apple TV, PSP and others. Follow the step by step guide below. Take care this tutorial just takes windows version screenshots, but it doesn’t matter if you are using a Mac, the steps are nearly the same. One thing is worth paying attention to is that you should download the right version of this program as per your situation. You have two options to import files to the program in order to convert your ASF videos. The first option is to drag and drop the desired files directly from the computer desktop unto the main interface of the converter program. The second option is to click on the button for Add Files at the top left corner and browse the folders on your computer to choose the file(s) that you want. Note that you could import several files in batch conversion if you want. Click the drop down list to choose the output format. You are able to browse the computer folders to find the right destination for the converted files. 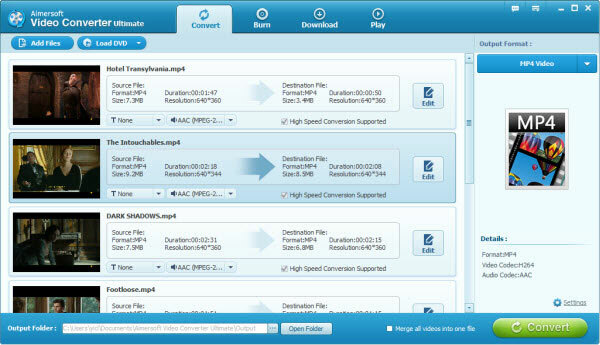 The ASF Video Converter supports all the regular formats such as MOV, MP4, WMV, MKV, AVI, FLV and more. In addition, there are over hundred and fifty video presets for many portable devices such as iPhone, PSP, iPad, HTC, iPod and Samsung. You could also convert your 2D videos to 3D format. With a built-in editor, this ASF converter allows you to edit your files as you like within several steps. You can adjust your video by trimming to get the part of the video you like best and crop the unwanted part like the black margin. You can also apply some movie effects and add watermarks and subtitles to your video to customize your video. Once you follow the quick steps to setup, you can click Convert to start the conversion. After the process is completed, you will find the finished files in the destination folder. Now, you are able to sit back, relax and enjoy your new movie files. 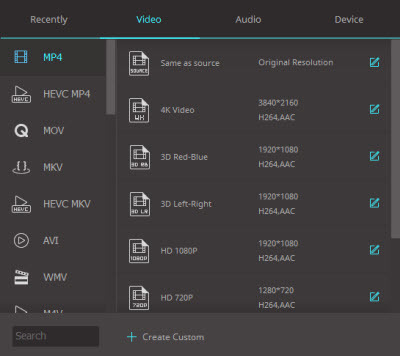 Take advantage of this ASF Video Converter tool from Aimersoft when you want to change your videos to other popular formats for sharing and viewing.